Silly Scott has been the most popular children's entertainer in Fareham and Gosport and all over Hampshire for over 20 years. Providing first class entertainment at Birthday Parties, Fun Days, Shopping Centres, Local Attractions and Corporate Events where only the very best is required. His skills include Family Magic Shows, Balloon Modelling, Magic & Balloon Workshops, Strolling Close Up Magic, Face Painting, Mini Disco and Games with Competitions . So if you are looking for only the best children's entertainer in Fareham and Gosport (infact the whole of Hampshire) for your next birthday party or event, then look no further. Silly Scott’s Multi Award Winning family entertainment will be the best decision you ever make... Guaranteed!! As well as providing Children's Entertainers in Fareham and Gosport, Silly Scott Also covers the surrounding area's of Portsmouth, Southampton and all of Hampshire. If you are looking for a children's entertainer in Fareham & Gosport or a Kids Magician in the Fareham & Gosport area. Including surrounding area's Portsmouth, Southampton, Lee on Solent, Stubbington, Portchester, Locks Heath, Waterlooville, Wickham, Bishops Waltham, Whiteley, Droxford, Botley, Titchfield, Warsash, Hedge End, Eastleigh, Southsea, Petersfield. Then look no further Silly Scott is the entertainer you have been searching for. He has been entertaining in Fareham & Gosport or the Fareham & Gosport area for many years, and has built a very high reputation in children's entertainment. 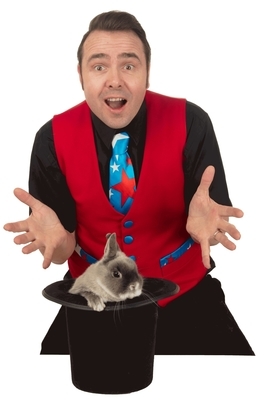 Don't delay call today to book Silly Scott Hampshire's premier Children's Entertainer & Magician.